Golden Wonder Ice Plant- (Delosperma "Golden Wonder") is a moderate growing succulent plant that can be grown in USDA Plant Hardiness Zones 6A through 8B. It matures to an average height of 1 inch to 1 foot and an average width of 1 foot to 2 feet, depending on climate and other environmental factors. It prefers growing in a location that provides full sun and grows best when planted in sand, loam, clay or silt soil that is well drained. 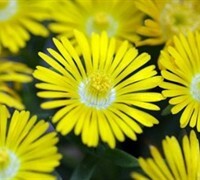 In the spring and summer Golden Wonder Ice Plant- (Delosperma "Golden Wonder") produces yellow and golden yellow flowers. The foliage is medium green and dark green in color. It attracts visual attention and is resistant to deer, drought and insects. Golden Wonder Ice Plant- (Delosperma "Golden Wonder") can be useful in the landscape in mass plantings, as a border or edger, around decks, swimming pools, and other outdoor living areas, as a groundcover, between stepping stones and pavers, in hanging baskets, in small groupings or mailbox plant and also in rock or xeriscape gardens or perennial gardens. 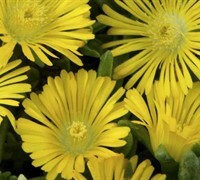 From the Wheels of Wonder Ice Plant Series comes the amazing Golden Wonder. The star-like flowers are bright golden yellow with white centers. This heat and drought tolerant groundcover will light up your landscape for sure. For those that wish to add the WOW! factor to your garden, Golden Wonder will be sure to satisfy. Blooms spring through summer!